If you have time to snoop into the life of other people, then this habit will close success’s door for you. If you want to succeed, then you should not waste your time on stupid things and stupid people. Being Weak in this world is the biggest sin, so become Economically, Mentally and physically strong. Your anger can benefit others, but it will always harm you and will break the momentum of your work. Become expert/skilled in any work, after that wherever you will live, everywhere people will give you importance, because knowledgeable people are required everywhere. Special skill – Bright life. Think before starting any work that you do have the capacity and interest to do the work. Otherwise you will have to deal with a lot of stress. Your capacity – your success……………. To be with bad people means to be with sweet poison, which in start is sweet, but the end is deadly. – To be with bad people means to self destruction. True Love is unlimited and if a love story has an end…. It means it is not a love story. Problems are part of life, don’t be afraid from problems. Just remember these lines, “Problems can only stop you to get success, if you lose hope before crossing the problems”. Crossing the problem – Success. Regular efforts and best use of time can make any goal achievable. Regular efforts + Best use of time – Your Success. Accept your weaknesses and get rid from them. 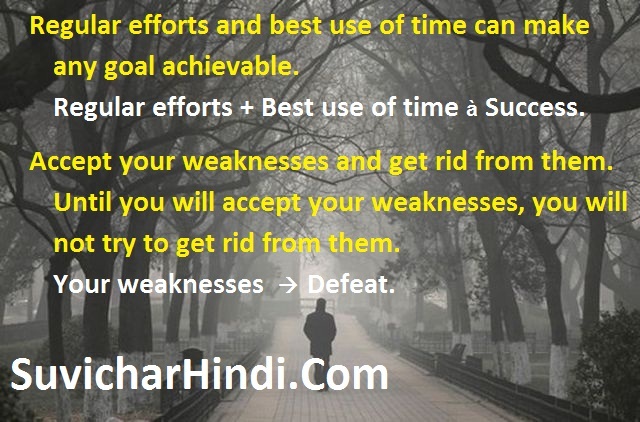 Until you will accept your weaknesses, you will not try to get rid from them. Never forget those persons, who helped you in your difficult conditions. Whenever you do anything for others, don’t expect anything in return. Expectations from others – Sadness. Careless persons never become successful, because lack of knowledge can be fulfilled by learning new things. But, there is no cure for carelessness.